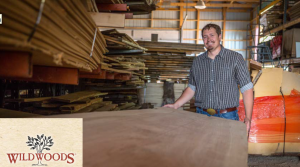 businesses and restaurants, Wildwoods Manufacturing uses a refined process to craft high quality pieces. They even create items using reclaimed barnwood. Ryan Hexum, owner of Wildwoods Manufacturing, bought a home for Wildwoods in 2013. Utilizing an SBA 504 refinance loan provided by WBD and financing from Hayward Community Credit Union, Ryan was able to refinance the debt he acquired in purchasing the real estate the company that he operates out of. The refinance provides Ryan with a long-term fixed rate and additional working capital. It also adds three new jobs to the Hayward community.